Fifty-eight years in the making, his slow hunch about the pendulum’s “magical property” had finally begun to take shape. The idea lay at the intersection point of multiple disciplines and interests: …Physics, astronomy, maritime navigation, and the daydreams of a college student: all these different strains converged in Galileo’s mind. “After experiencing a desire to invent a particular thing, I may go on for months or years with the idea in the back of my head,” said Nikola Tesla. Tesla calls this the incubation period, which precedes direct effort on the invention. Science writer, Steve Johnson, calls it a slow hunch; an idea that comes into focus over a long time. 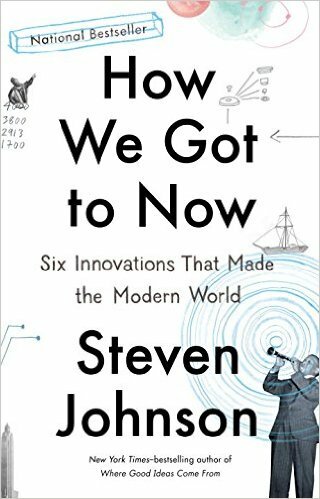 Johnson discusses several examples of how slow hunches develop in his excellent book, Where Good Ideas Come From and again is his most recent book How We Got to Now: Six Innovations That Made the Modern World. Johnson shows how innovation is most often a product of slow hunches and not eureka moments. One of the six innovations that made the modern world is the clock for keeping accurate time. In Johnson’s discussion of time, he recounts the events and circumstances that led up to Galileo invention of the pendulum clock. The story shows the invention of the pendulum clock was not a product of a eureka moment, but of Galileo’s experiences and cross-disciplinary studies over 58 years. Johnson starts with Galileo’s experience at university. Suspended from the ceiling is a collection of altar lamps. They are motionless now, but legend has it that in 1583, a nineteen-year-old student at the University of Pisa attended prayers at the cathedral and, while daydreaming in the pews, noticed one of the altar lamps swaying back and forth. While his companions dutifully recited the Nicene Creed around him, the student became almost hypnotized by the lamp’s regular motion. No matter how large the arc, the lamp appeared to take the same amount of time to swing back and forth. As the arc decreased in length, the speed of the lamp decreased as well. To confirm his observations, the student measured the lamp’s swing against the only reliable clock he could find: his own pulse. Galileo’s daydreaming about time could have been influenced by the fact that his father was a music theorist and played the lute. Twenty years later, after becoming a professor of mathematics, Galileo decided to build a pendulum that would recreate what he had observed at Pisa. The then existing clocks did not keep accurate time. They could be off by tweenty minutes a day and had to be reset using a sundial. But no one needed accurate clocks in the sixteenth century for keeping daily schedules. The need for accurate time keeping arose from shipping navigation needs. But sailors lacked any way to determine longitude at sea. Latitude you could gauge just by looking up at the sky. But before modern navigation technology, the only way to figure out a ship’s longitude involved two clocks. One clock was set to the exact time of your origin point (assuming you knew the longitude of that location). The other clock recorded the current time at your location at sea. The difference between the two times told your longitudinal position: every four minutes of difference translated to one degree of longitude, or sixty-eight miles at the equator. The problem with this system was the accuracy of the clock at the point of origin. With timekeeping technology losing or gaining up to twenty minutes a day, it was practically useless on day two of the journey. All across Europe, bounties were offered for anyone who could solve the problem of determining longitude at sea. So, after years of working in various disciplines and influenced by the rise of a need for accurate time keeping, Galileo together with his son, drew up plans for the first pendulum clock. Fifty-eight years in the making, his slow hunch about the pendulum’s “magical property” had finally begun to take shape. The idea lay at the intersection point of multiple disciplines and interests: Galileo’s memory of the altar lamp, his studies of motion and the moons of Jupiter, the rise of a global shipping industry, and its new demand for clocks that would be accurate to the second. Physics, astronomy, maritime navigation, and the daydreams of a college student: all these different strains converged in Galileo’s mind. Owning to the improved accuracy of the pendulum clock it was in wide use by the end of the next century. Galileo’s invention of the pendulum clock is just one example of many where the invention resulted from a long series of events and cross-disciplinary influences rather than a momentary flash of genius.